Cell Proliferation Induced by IL-12 and Neutralization by Mouse IL-12/IL-23 p40 Antibody. Recombinant Mouse IL-12 (Catalog # 419-ML ) stimulates proliferation in PHA-activated mouse splenocytes in a dose-dependent manner (orange line), as measured by Resazurin (Catalog # AR002 ). 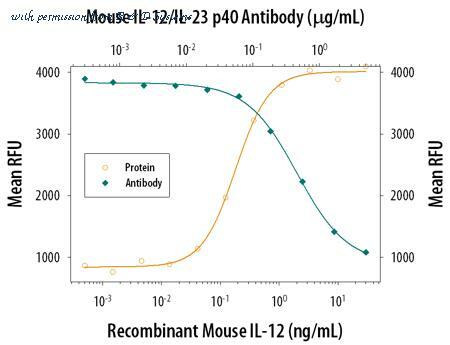 Proliferation elicited by Recombinant Mouse IL-12 (1 ng/mL) is neutralized (green line) by increasing concentrations of Rat Anti-Mouse IL-12/IL-23 p40 Monoclonal Antibody (Catalog # MAB4991). The ND50 is typically 0.04-0.3 ╡g/mL. 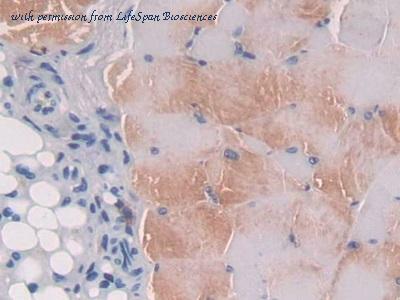 IL12B / IL12 p40 antibody (1µg/ml) staining of Rat Liver lysate (35µg protein in RIPA buffer). Primary incubation was 1 hour. Detected by chemiluminescence. Western blot of recombinant IL12B / IL12 p40. Mouse Il12b Antibody western blot of mouse heart tissue lysates (35 ug/lane). 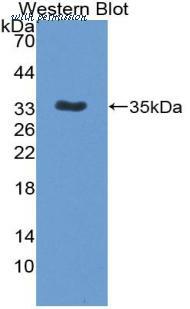 The Il12b antibody detected the Il12b protein (arrow).